From and to the spinal cord are projections of the peripheral nervous system in the form of spinal nerves (sometimes segmental nerves). 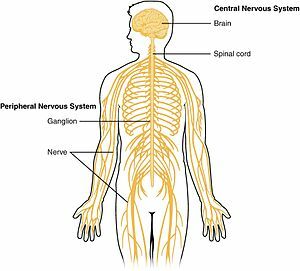 The nerves connect the spinal cord to skin, joints, muscles etc. and allow for the transmission of efferent motor as well as afferent sensory signals and stimuli. This allows for voluntary and involuntary motions of muscles, as well as the perception of senses. All in all 31 spinal nerves project from the brain stem, some forming plexa as they branch out, such as the brachial plexa, sacral plexa etc. 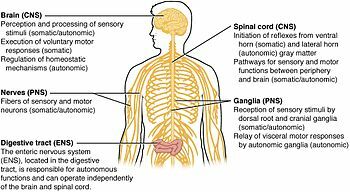 Each spinal nerve will carry both sensory and motor signals, but the nerves synapse at different regions of the spinal cord, either from the periphery to sensory relay neurons that relay the information to the CNS or from the CNS to motor neurons, which relay the information out. The spinal cord relays information up to the brain through spinal tracts through the “final common pathway” to the thalamus and ultimately to the cortex. Two pairs of cranial nerves; the olfactory nerves and the optic nerves are often considered structures of the CNS. This is because they do not synapse first on peripheral ganglia, but directly on CNS neurons. The olfactory epithelium is significant in that it consists of CNS tissue expressed in direct contact to the environment, allowing for administration of certain pharmaceuticals and drugs. The next structure rostral to the medulla is the pons, which lies on the ventral anterior side of the brainstem. Nuclei in the pons include pontine nuclei which work with the cerebellum and transmit information between the cerebellum and the cerebral cortex. In the dorsal posterior pons lie nuclei that are involved in the functions of breathing, sleep, and taste. The cerebellum lies behind the pons. The cerebellum is composed of several dividing fissures and lobes. Its function includes the control of posture and the coordination of movements of parts of the body, including the eyes and head, as well as the limbs. Further, it is involved in motion that has been learned and perfected though practice, and it will adapt to new learned movements. Despite its previous classification as a motor structure, the cerebellum also displays connections to areas of the cerebral cortex involved in language and cognition. These connections have been shown by the use of medical imaging techniques, such as functional MRI and Positron emission tomography. The two structures of the diencephalon worth noting are the thalamus and the hypothalamus. The thalamus acts as a linkage between incoming pathways from the peripheral nervous system as well as the optical nerve (though it does not receive input from the olfactory nerve) to the cerebral hemispheres. Previously it was considered only a “relay station”, but it is engaged in the sorting of information that will reach cerebral hemispheres (neocortex). Connecting each of the hemispheres is the corpus callosum as well as several additional commissures. One of the most important parts of the cerebral hemispheres is the cortex, made up of gray matter covering the surface of the brain. Functionally, the cerebral cortex is involved in planning and carrying out of everyday tasks. The neural tube gives rise to both brain and spinal cord. The anterior (or ‘rostral’) portion of the neural tube initially differentiates into three brain vesicles (pockets): the prosencephalon at the front, the mesencephalon, and, between the mesencephalon and the spinal cord, the rhombencephalon. 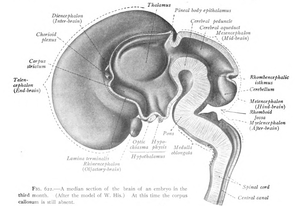 (By six weeks in the human embryo) the prosencephalon then divides further into the telencephalon and diencephalon; and the rhombencephalon divides into the metencephalon and myelencephalon. The spinal cord is derived from the posterior or ‘caudal’ portion of the neural tube. Planarians, members of the phylum Platyhelminthes (flatworms), have the simplest, clearly defined delineation of a nervous system into a CNS and a PNS. 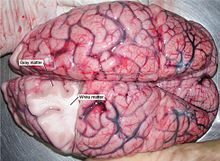 Their primitive brains, consisting of two fused anterior ganglia, and longitudinal nerve cords form the CNS; the laterally projecting nerves form the PNS. 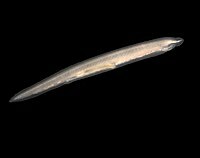 A molecular study found that more than 95% of the 116 genes involved in the nervous system of planarians, which includes genes related to the CNS, also exist in humans. Like planarians, vertebrates have a distinct CNS and PNS, though more complex than those of planarians. Mammals – which appear in the fossil record after the first fishes, amphibians, and reptiles – are the only vertebrates to possess the evolutionarily recent, outermost part of the cerebral cortex known as the neocortex. 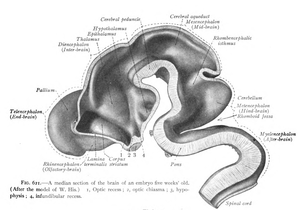 The neocortex of monotremes (the duck-billed platypus and several species of spiny anteaters) and of marsupials (such as kangaroos, koalas, opossums, wombats, and Tasmanian devils) lack the convolutions – gyri and sulci – found in the neocortex of most placental mammals (eutherians). Within placental mammals, the size and complexity of the neocortex increased over time. The area of the neocortex of mice is only about 1/100 that of monkeys, and that of monkeys is only about 1/10 that of humans. In addition, rats lack convolutions in their neocortex (possibly also because rats are small mammals), whereas cats have a moderate degree of convolutions, and humans have quite extensive convolutions. Extreme convolution of the neocortex is found in dolphins, possibly related to their complex echolocation. There are many CNS diseases and conditions, including infections such as encephalitis and poliomyelitis, early-onset neurological disorders including ADHD and autism, late-onset neurodegenerative diseases such as Alzheimer’s disease, Parkinson’s disease, and essential tremor, autoimmune and inflammatory diseases such as multiple sclerosis and acute disseminated encephalomyelitis, genetic disorders such as Krabbe’s disease and Huntington’s disease, as well as amyotrophic lateral sclerosis and adrenoleukodystrophy. Lastly, cancers of the central nervous system can cause severe illness and, when malignant, can have very high mortality rates. Symptoms depend on the size, growth rate, location and malignancy of tumors and can include alterations in motor control, hearing loss, headaches and changes in cognitive ability and autonomic functioning. 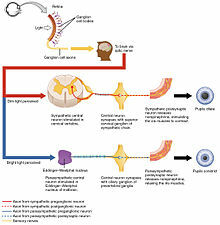 ^ “Medical Subject Headings (MeSH): Optic Nerve”. National Library of Medicine. Archived from the original on 2 October 2013. Retrieved 28 September 2013. ^ a b c Gizurarson S (2012). “Anatomical and histologica\ ]=\ factors affecting intranasal drug and vaccine delivery”. Current Drug Delivery. 9 (6): 566–582. doi:10.2174/156720112803529828. PMC 3480721. PMID 22788696. ^ “The brain and spinal cord – Canadian Cancer Society”. www.cancer.ca. Retrieved 19 March 2019. ^ Rakic, P (October 2009). “Evolution of the neocortex: a perspective from developmental biology”. Nature Reviews. Neuroscience. 10 (10): 724–35. doi:10.1038/nrn2719. PMC 2913577. PMID 19763105. ^ Hickman, Jr., Cleveland P.; Larry S. Roberts; Susan L. Keen; Allan Larson; Helen L’Anson; David J. Eisenhour (2008). Integrated Princinples of Zoology: Fourteenth Edition. New York, NY, USA: McGraw-Hill Higher Education. p. 733. ISBN 978-0-07-297004-3. ^ Mineta K, Nakazawa M, Cebria F, Ikeo K, Agata K, Gojobori T (2003). “Origin and evolutionary process of the CNS elucidated by comparative genomics analysis of planarian ESTs”. PNAS. 100 (13): 7666–7671. doi:10.1073/pnas.1332513100. PMC 164645. PMID 12802012. Archived from the original on 24 September 2015. ^ American College of Radiology; American Society of Neuroradiology (2010). “ACR-ASNR practice guideline for the performance of computed tomography (CT) of the brain”. Agency for Healthcare Research and Quality. Reston, VA, USA: American College of Radiology. Archived from the original on 15 September 2012. Retrieved 9 September 2012.